In the eleventh and twelfth centuries Troubadours, Trouveres and Minstrels were the poets and musicians who influenced Medieval Music. The troubadours and minstrels sang songs of courtly love and romance. Noble ladies of the Medieval period were famous for their patronage of Medieval Music. Eleanor of Aquitaine married King Henry II of England in 1152 and brought her love of music and the troubadours to the English court transferring the tradition to England. The Troubadours were originally travelling musicians. The early Troubadours travelled from one village to the next and many also travelled abroad. The role of the Troubadours changed to part of an elite society of royalty and nobles. The themes of the songs sung by the Troubadours mainly dealt with Chivalry and Courtly love - romantic ballads. In Germany, the troubadours became Minnesingers, or singers of love songs. The German minnesingers differed from the troubadours in that they accompanied their songs on the viol, instead of employing Jongleurs. The Trouveres were troubadours of nobler birth with finer imagination, including kings and nobles. They were a school of poets who flourished in Northern France and Europe from the 11th to the 14th century. The Minstrels earned a living by the arts of poetry and music, and sang verses to the accompaniment of a lute, harp or other instruments. Minstrels often created their own ballads but they were also famous for memorising long poems based on myths and legends which were called 'chansons de geste'. 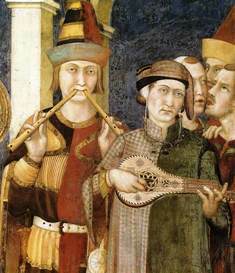 The Jongleurs were often the assistants of the Troubadours or Minstrels. Jongleurs gained a reputation as itinerant entertainers and many were deemed to be vagabonds and untrustworthy. Their repertoire included various skills in dancing, conjuring, acrobatics, and juggling. The Waits were originally employed as watchmen who alerted people to danger by playing loud instruments. The role of the Waits gradually evolved into groups of musicians employed by the towns. The Waits therefore became official musicians employed in the large English towns, who were equivalent to the town band. The Waits were expected to compose and play music for important town and civic ceremonies and occasions. There were many Musical Instruments that can be described as part of the following categories including Woodwind Instruments of music which were blown like trumpets or bagpipes, String Instruments of music which were played with a bow or plucked and Percussion Instruments of music including various forms of drums and bells which were used during the Middle Ages. Flageolet was a small fipple flute with four finger holes and two thumb holes. The Organistrum and the Pipe Organ were other types of Medieval Musical instruments as was the Hurdy-Gurdy. The Hurdy-gurdy music was introduced to England during the 12th century. The Medieval Times website provides interesting facts, history and information about the musicians and styles of music which scatter the history books including Medieval Music. The Medieval Life and Times Sitemap provides full details of all of the information and facts about the fascinating subject of the lives of the people who lived during the historical period of the Middle Ages. The content of this article on Medieval music provides free educational details, facts and information for reference and research for schools, colleges and homework for history courses and history coursework.